Titles held: National Boxing Association World Heavyweight Championship (July 18, 1951 to Sept. 23, 1952). In 1962, the NBA would turn into the current WBA (World Boxing Association). 2018 Atlantic City Boxing Hall of Fame Inductee. 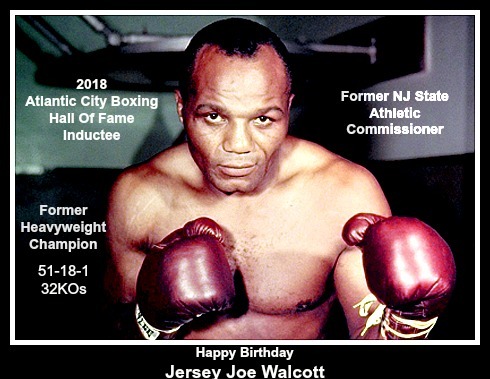 Also, Walcott was inducted into the International Boxing Hall of Fame in 1990; Ring Boxing Hall of Fame in 1969 and the World Boxing Hall of Fame in 1983. Voted in as the first African American Sheriff in Camden County, New Jersey in 1971. Disclaimer: All content provided on this blog is for informational purposes only. The Atlantic City Boxing Hall of Fame is not liable for any errors or omissions in this information. Any opinions or inquiries that you may have you can forward them to Rob Scott at robscottxl@msn.com.